This series of monographs presents critical and detailed reviews of particular aspects of marsupial biology, each written by a leading contributor to the discipline. It is not the intention to cover all aspects of marsupial biology, but to select topics that have reached a sufficiently advanced stage to warrant critical review and synthesis, and where marsupial research can make a unique or particular contribution to general theory. By adopting this approach it is hoped that the series will appeal not only to those interested in marsupials per se but also to those interested in the particular discipline treated. 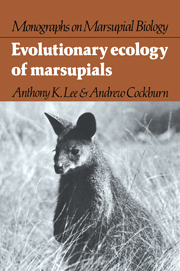 Forthcoming titles in the series will cover the evolution, immunology and energetics of marsupials.